Slotland has been saving its latest new one-of-a-kind slot machine until this weekend. Conjuring images of evil fairy tale witches, the new Witch’s Brew is a magical treat for Halloween. To celebrate the launch of the new game there are up to 45% Halloween Deposit Bonuses all weekend and a chance in a random draw for $500 just by spinning the Witch’s Brew reels! Witch's Brew is an uncomplicated single pay line slot machine where players watch the Witch's magic boil right in front of them. Players can bet as little as $0.50 or as much as $4.00 to see what the Witch has in store. During the game pots of jam fill up and boil over. Hidden witches activate Wild symbols according to the flavour of the overflowing jam. Boiling jam pots can activate more than one Wild symbol, increasing players’ chances of spinning a winning combination even more. 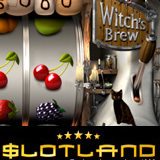 All Slotland players that log on this weekend, whether they’ve just signed up or been playing at the popular slots and video site since it began 12 years ago, will find a free $10 waiting in their account just to try the new Witch’s Brew. All weekend Slotland is giving an extra 20% Halloween Deposit Bonus on every deposit. On Sunday, combined with the Sunday Bonus Brunch, players can get up to 45% extra on deposits. Every spin on the Witch’s Brew between now and November 11 is one free entry in the Witch’s Brew Draw for $500. Like all of Slotland’s slots games, Witch’s Brew is tied to the Slotland progressive jackpot. Every time a player plays max bet on any of these games, some of the wager goes into the progressive jackpot pool. In this game, spinning three Wild Pumpkins wins the progressive jackpot. Slotland.com, which has just cleared up from its twelfth birthday celebrations, now has 19 one-of-a-kind slot machines and video poker games. Many of the instant-play games have recently been upgraded with enhanced graphics and sound effects. Six of the most popular games are also available on mobile phones and PDAs. After AYAMAMOTO of Japan won $89,384 on the new Lucky Ducts slot machine just last week, the jackpot at Slotland is currently just over $53,000 and climbing. Meanwhile at Slotland’s sister casino, WinADayCasino.com, the jackpot is nearly $150,000 and seriously tempting fate.